Curacao Weather: Hot, Hot, Hot! Curacao weather, with the average daytime high temperature around 87°F (30.6°C), this Caribbean island weather is sunny and warm year round. See below for current weather: Curacao. Night temperatures are only a bit lower, averaging around 87°F (25.6°C). Therefore, if you are looking for warm temperatures and sunny days, there is really no bad time to vacation in Curacao. When you think about Curacao and weather, you think warm, relaxing sun. And that is exactly what you get year around in Curacao. 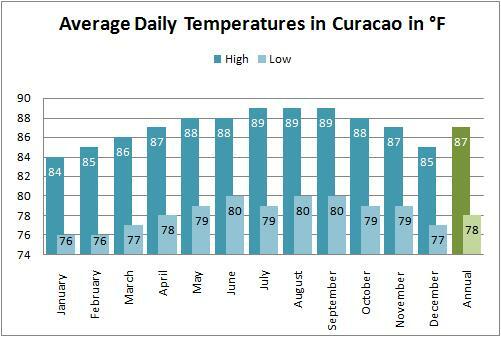 The hottest months in Curacao weather are July through September, with the daytime temperatures averaging 89°F (31.7°C) and nighttime temperatures averaging 80°F (26.7°C). Conversely, the coolest months are December through March, with daytime temperatures averaging 85°F (29.4°C)and a nighttime average temperature of 77°F (25°C). Refreshing trade winds blow constantly from the east, and are strongest in the spring months. Curacao and Weather: What is Your Season? Curacao's rainy season is from October to February, but as a rule even the rainy season doesn't take away from the beautiful weather for very long. The average annual rainfall is only about 20 inches, and the rain usually comes in occasional short nighttime showers, making Curacao a generally dry island. Rain during the day is very rare, and like the nighttime showers it only lasts a short time. Late fall is the wettest period, with the rainiest month in Curacao being December, having an average precipitation of 3.7 inches. The driest month is March, with only 0.7 inches of rainfall on average. When you think about Curacao and weather, you rarely think of hurricanes. This is because hurricanes are few and far between when talking about weather in Curacao. There have only been 5 direct hurricane hits to this island in the last 138 years, with one striking the island every 27 years or so on average. This is because Curacao is located outside of the hurricane belt. As a result there is not much to worry about at any time of the year when it comes to tropical storms interrupting Curacao weather. However, on occasion a tropical storm in other parts of the Caribbean will cause a few scattered days of cloudy weather in Curacao. This is very rare though, and occurs mostly in late summer through fall. Most days in the Curacao weather forecast are bright and sunny, making it an ideal tropical vacation spot.